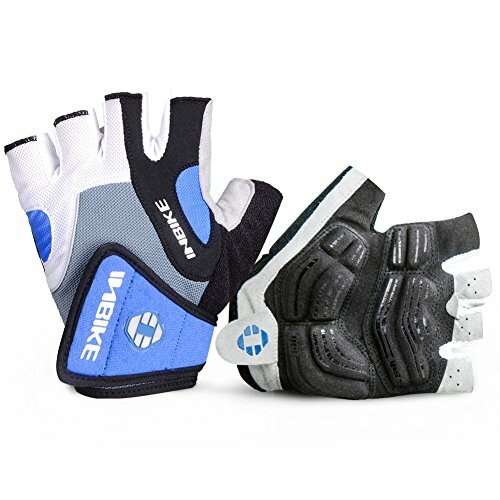 Mountain Bike gloves can be very useful cycling accessories to own, as they can provide you with extra grip on the steering bars of your mountain bike, or if you’re planning on using your bike for a long period of time, then the cycling gloves will prevent your hands from becoming sore. There are a lot of benefits to mountain bike gloves, and they can really make your riding experience a lot more enjoyable. Not only this, but they are also able to keep your hands warm if you’re planning on riding your bike in colder conditions. Therefore we’ve put together a list of the best mountain bike gloves to help guide you about which ones are best to purchase. 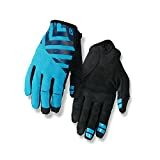 If you want to find a pair of mountain bike gloves that will be able to match the color of your bike, then these are ideal. This is because they are available in a whole variety of colors. They are made from 90% cotton and 10% nylon, plus, they are also wearing resistant, which makes them a whole lot more durable and you will never see any wear and tear from them no matter how many times you use them. These bike gloves are also padded with foam to make them more flexible, and they will increase the amount of friction on the handlebar of your bike. Why We Like It – We liked these mountain bike gloves because they are also made from a lycra fabric that allows any steam to easily escape from the gloves. 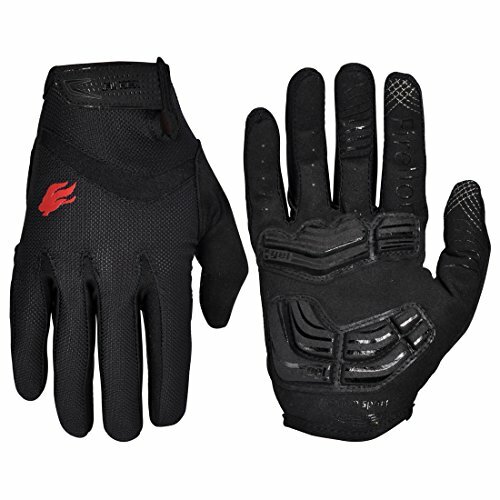 These mountain bike gloves are actually very unique because they come with 100% breathable material that is able to very quickly absorb sweat when you’re riding your bike. It also has a triangle shockproof system which means that the padding on the gloves will enable there to be an anti-vibration system so it will protect your hands. They are a pull buckle design that is very quick and easy to put on and off so they will be able to save you time. They are able to fully protect your hand, as well as minimize the oppression of your wrist. Why We Like It – We liked this product because they are able to protect your wrists and your hands while you’re riding. These mountain bike gloves will actually fully protect your hands and your fingers too, as they are designed in a way to do this. You can purchase these gloves in different sizes, and they have sizes that are suitable for youths too. They have direct injected rubber logos and graphics to protect the back of your hands and your fingers from any injury. The gloves can be used for any type of bike riding, whether it’s mountain or BMX. They come with a one-year replacement warranty, so you have nothing to worry about if something goes wrong. Why We Like It – We liked these mountain bike gloves because you get a warranty with them, which is able to give you peace of mind if anything goes wrong. If you’re looking for a pair of mountain bike gloves that are made from the highest quality heavy duty material, then these will definitely be ideal for you. 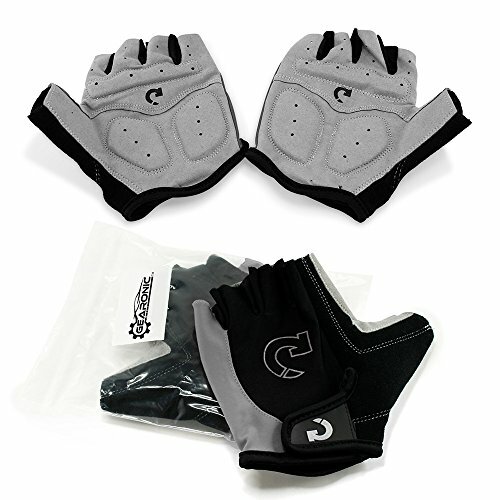 They are durable and have a padded foam pad inside the gloves in order to protect your hands. 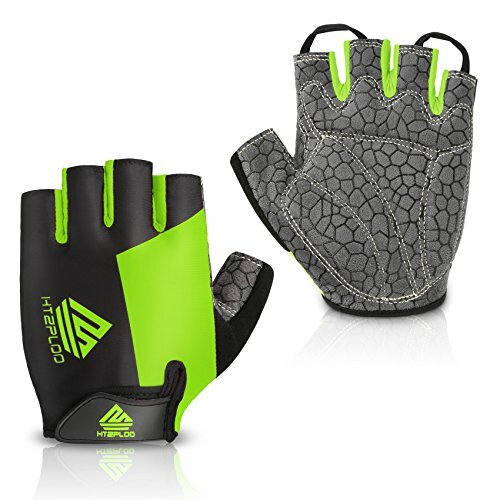 They also have a breathable mesh back that is designed to provide you with comfortable compression and support your fingers and palms at the same time. 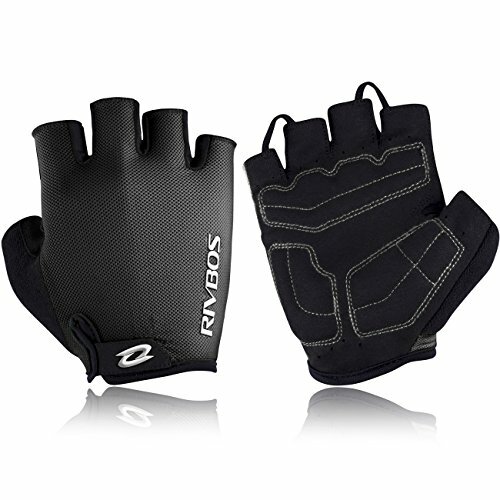 These bike gloves are actually suitable for any type of biking that you desire to do. They have anti-shock slip padding and are available in different sizes, plus, they are washing machine safe. Why We Like It – We liked this product because they can actually be used for any type of biking you want to do. These mountain cycling gloves are actually fingerless, and this feature can really help you gain more grip on the handlebars of your bike. You can purchase these in a whole range of different sizes, so you don’t have to worry about them not fitting properly. They are made from high elastic lycra fabric and high elastic knitted mesh fabric, which actually makes them very comfortable and breathable. They have a sticky Velcro buckle on the wrist, which makes them very easy to get on and off. They are also made from non-slip silicone, plus, they have a pull buckle on the fingertip, meaning that it’s very easy to take them off. Why We Like It – We liked these mountain bike gloves because no matter how slippery the surface may be on your handlebars the gloves will prevent your hands from ever slipping. One thing that we liked the most about these gloves was the design of them, as they have a very modern look to them. Plus, you can also purchase these bike gloves in a whole range of different colors, so they are able to easily match your bike. They have very effective shock absorbing padding protection, and this feature will also be able to relieve hand fatigue as well as reduce road vibration. 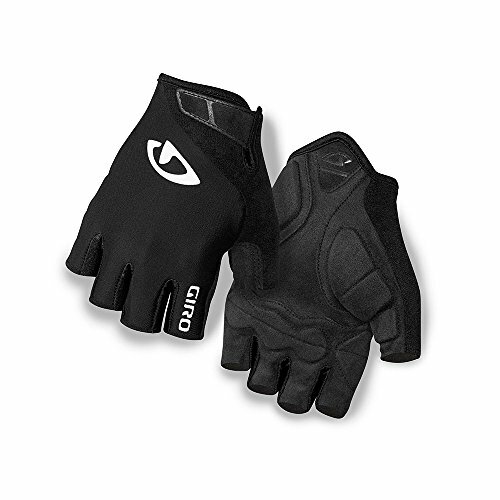 They have an anti-slip silicone gel feature on the palm of the glove to help you control the handlebar more. Not only this, but they have two little finger loops to help you pull the gloves off of your hands without them going inside out. Why We Like It – We liked this product because they can also stop your hands from feeling tired so you can ride for a lot longer. These mountain bike gloves actually have EVA padding, so when you’re wearing them, it will allow the gloves to mold to the exact shape of your hands like it’s a personal fit. They have a hook and loop closure strap, and this makes it very easy for you to be able to remove them with no problems. They come with a one-year manufacturers warranty, so if you have any problems, you have a guarantee. These bike gloves have lighter padding compared to others, but they are certainly just as comfortable, if not more. Why We Like It – We liked these mountain bike gloves because they were so cushioning and comfortable to wear on your hands. If you’re on the hunt for a pair of mountain bike gloves that look very sporty and very high-tech, then these are ideal for you. The design of these gloves will make you look like a professional biker. They are made from high elastic lycra and knitted mesh fabric, which makes them breathable and very comfortable to wear. They come in two different colors that you can pick from, and they have extra padding with a thickened EVA material. This feature makes them super shock absorbent, you will also never feel any pain when you’re wearing them, and they will prevent your hands from feeling tired. Why We Like It – We liked this product because it has extra padding and very thick EVA, which makes it very comfortable for you to wear for long periods of time. 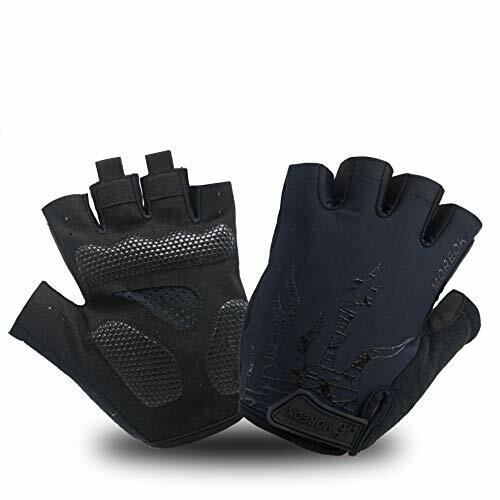 These mountain bike gloves are actually multifunctioning, and this is because they can be used for a whole load of other types of cycling, like BMX and road cycling. They are made from breathable materials to stop your hands from ever feeling sweaty, and they will even keep your hands comfortable when the weather is hot or cold. One massive bonus about these gloves is that they have a touch recognition feature, so you can easily use any smart touch screen device with these. They also have adjustable straps on the gloves, so you can easily loosen or tighten them as well. Why We Like It – We liked these mountain bike gloves because they have a very awesome feature and that’s the fact that you can easily use your touch screen while you’re wearing them. These gloves are available in a few different colors so you can purchase a pair that suits you the best. They also come in a whole range of different sizes so you will be able to find the perfect fit for your hands. They have an ultra thermal and windproof fleeced lining, as well as a lengthened wrist hook and loop fastener. This means that no cold air will be able to get to your hands at all. They are also gel padded, which is able to protect your hands from getting any injuries. These gloves also have the touch screen feature, which allows you to be able to use any touch screen gadget while you’re still wearing them. Why We Like It – We liked this product because the gel padding really prevents your hands from getting injured. 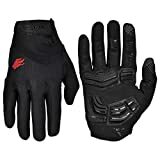 In the list above there is a whole load of different mountain bike gloves, and some of these are even suitable for other types of cycling as well. This can make it very confusing, and it can put you in a right dilemma over which ones you should purchase. Not only this, but a lot of them come with a whole range of different features so you will need to compare them all. In our buyers guide just below we’ve highlighted the most important factors that you will need to look out for before you do purchase any mountain bike gloves. You would have probably have noticed that there are two different types of designs for bike gloves. One is that they actually don’t come with any fingertips so the tips of your fingers would be exposed, while the other design actually covers the whole of your hand and this includes the tips of your fingers as well. You may wonder which one is better out of the two, but both of them have a range of different features that are able to benefit you. For instance, the gloves that don’t have the fingertips may be better for you to use during the summertime, as they won’t create as much sweat over your hands and they will also be very good if you want to use them on an indoor bike as well. Whereas, the gloves that are fully covered will be able to provide you with quite a bit more protection, as you will be completely covered up, and it will prevent the tips of your fingers from getting injured. Not only this but if you ride your bike for a long period of time, then this will also prevent any sores or blisters from forming on the tips of your fingers. It’s really ideal for you to know what you want to use the gloves for before you decide to purchase a pair. It’s very important that you purchase a pair of mountain bike gloves that are made from sturdy and high-quality materials. If they are not then it’s likely that they won’t be able to last you as long and they could get damaged quite easily. The gloves should have some type of padding on the outside of them, as this will make them very comfortable and it will also protect your hands as well. It’s also important that they have some type of mesh material on them too, as this will allow your hands to breath and not become sweaty. Not only this, but the inside of the glove should be made from a type of EVA material, as this will provide you with the ideal comfort. In the list above you would have noticed that some of the gloves have a multifunctioning feature, which is a very useful feature to have. This is because it means that they don’t just have to be used for mountain biking, as they can be used for other types of cycling as well. 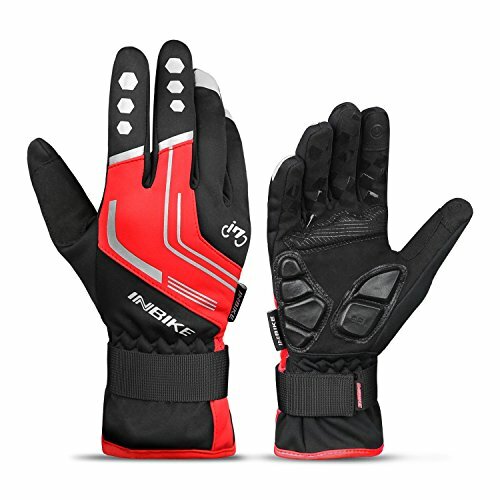 Therefore it’s important that you know what type of cycling you desire to do before you purchase them, because if you want to be able to use them for other purposes, then it’s best to read the description of the gloves and check to see if they have a multifunctioning feature. After you have worn your mountain bike gloves for quite some time they are bound to become quite dirty, or even if you fall off and land on dusty terrain or muddy terrain then they will more than likely become dirty then. There are a couple of ways that you can clean them, if they aren’t that dirty, then you can always use a wet wipe to wipe away any dirt that may be on them. It’s best to do this as soon as you notice the dirt though, as it can be quite difficult to get off if it dries out. Another thing that you can do is put them in the washing machine, you will need to make sure that they are machine washable before you do this though, as you don’t want them to end up ruined. If they aren’t machine washable, then you can always hand wash them and leave them to be able to dry naturally. One thing you will want is for your bike gloves to last you a very long time because it can be annoying if you have to keep on buying a new pair all the time. This is why it’s very important that you do maintain them and if you do ever fall off, you should check to see if they have been damaged in any way before you start using them again. This is because if you start using damaged bike gloves and you have another accident, your hands or wrists could get injured. Plus, if you don’t notice that they have been damaged and you decide to carry on wearing them, then it could cause them to get damaged even more. To maintain your gloves, you need to simply check them over after each time that you have worn them to see if they’ve been damaged at all. How do mountain bike gloves protect you from injuries? This is the main reason why it’s so important that you do wear mountain bike gloves or any other type of bike gloves if you’re planning on cycling or going a bit off road on your bike. This is because if you happen to fall off of your bike at any point, the materials that the gloves are made out of will be able to completely protect your hands and stop them from getting injured. Therefore you won’t hurt yourself as much. Not only this but if you’re planning to cycle quite a long distance for a long time, then it’s likely that your hands will start to become sore from being on the handlebars too long. 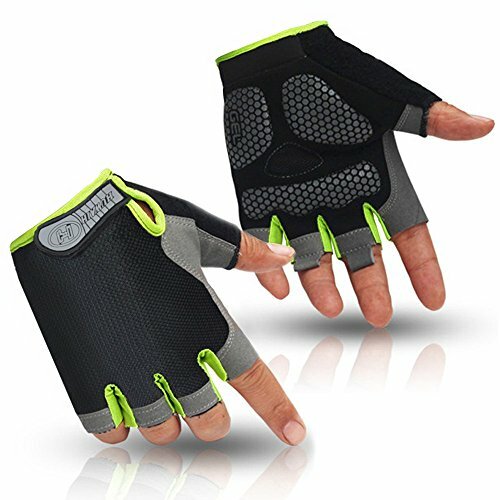 This is where bike gloves can be very useful because they will be able to stop your hands from becoming sore and they can even prevent blisters from forming. When you try bike gloves on it’s important that you take a lot of notice about the webbing between your pointer finger and your thumb. If the glove doesn’t scrunch up, then it means that it is a good fit, but also you need to make sure that they are not too tight between these two points as well. Otherwise, it will indicate that they don’t fit you properly. Sometimes cyclists don’t always wear bike gloves in order to protect their hands, as they actually wear them to keep their hands warm as well. Plus, when you wear them, it also stops you from being able to feel any sharp breezes that may be blowing in your direction. There are many different mountain bike gloves all across the internet, and you will also find them in many different bike stores in America. 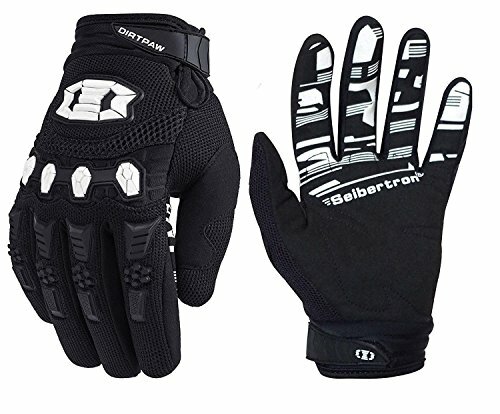 It can be quite difficult to decide which ones are the best ones for you to purchase when there are so many different brands of mountain bike gloves just all looking at you. Before you do decide to purchase a pair, it’s best to look at what features they have and then compare these features with other mountain bike gloves. This is because another pair may actually suit you better. It’s also important that you read the description of the product and see what type of materials they are made out of. This is because this will indicate how durable they are and how much they will be able to protect your hands when you’re cycling. It’s also important that you read through our buyers guide about what you should look out for before you do go ahead and purchase a pair of mountain bike gloves. This is because you want to make sure that they will be able to do the job that you require them to do.